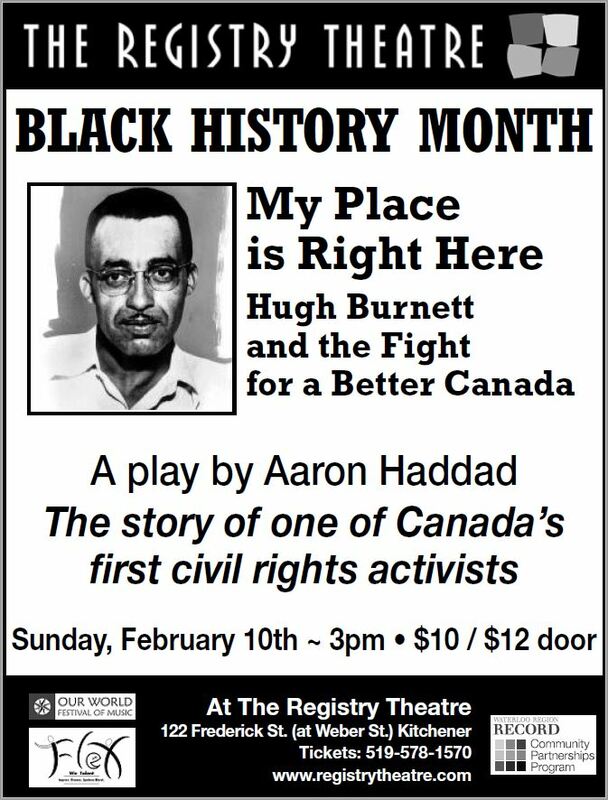 The story of one of Canada’s first civil rights activists. Written and directed by Aaron Haddad. Performed by the Flex We Talent players. Born in 1918 in Dresden, Ontario, Hugh Burnett is a civil rights hero who changed Ontario human rights laws for the benefit of all who live in Ontario today. A regular man with an extraordinary fire, he was descended from settler, indigenous, and formerly enslaved peoples who had escaped from America to Canada. He came of age in a farming community whose segregationist practices were derived from the customs and laws of the North American institution of slavery. In post World War II Dresden, neither Hugh, nor any person deemed to be of colour, was allowed to sit in a local restaurant and purchase a cup of coffee – about 17% of the local population. Hugh Burnett could not, and did not accept this. He formed the National Unity Association. He formed alliances with activists from around the province of different ethnic backgrounds; he led and orchestrated sitins; he gathered and presented evidence; he engaged the local and national press, and petitioned the government of Ontario premier Leslie Frost. His activism led to the passage of the Fair Employment and Practices Act, and the Fair Accommodation Practices Act in the 1950s, two pieces of legislation that would become the foundation of Ontario human rights law today. But that was not the end of the story. Racial discrimination continued, and it was only through the continued efforts of Hugh Burnett, and many others, that full human rights was eventually established. Writer/director Aaron Haddad ~ Aaron is Canadian born of Jamaican heritage. He has previously written about themes of social justice. Aaron loves to work with the volunteer players of Flex We Talent who are similarly passionate about honouring our cultures through committed, excellent, accessible theatre. Presented by Our World Festival, Flex We Talent, and The Registry Theatre. With support from the Congress of Black Women Waterloo Region and the Canadian Caribbean Association of Waterloo Region.